The following is a quirky collection of radio commercial jingles from two of Buffalo’s most famous, and longest operating breweries. 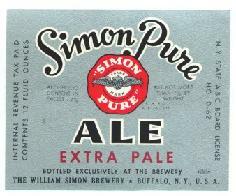 Simon Pure was one of the oldest operating Buffalo breweries closing in 1971. Simon's, like many breweries, started under a different name. The William Simon Brewery was the successor to the John Schusler Brewery, founded in 1859 located in Buffalo, New York. William Simon purchased the brewery in 1896, after a period as Schusler's brewmaster. It reopened after Prohibition and built a strong local following for its Simon Pure Beer and Old Abbey Ale. The William Simon Brewery managed to outlast many other the other breweries in Buffalo, finally closing in 1973. After the brewery closed, its brands were purchased and produced for a time by the Fred Koch Brewery of Dunkirk, New York, until it closed in about 1980. Iroquois became the largest producer after Prohibition. 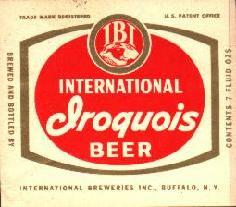 By the 1950's, under the ownership of the Weigel Family Iroquois became the biggest brewer Buffalo had ever known. In 1952 the brewery put out 500,000 barrels of beer and employed 550 men, with a peak output at 607,000 barrels. In the 1950's Iroquois brewery alone sold 40% of all beer drank in Buffalo and produced more beer than all four of their local competitors combined. In March of 1955, Iroquois Beverage Corporation merged with Frankenmuth Brewing Co. of Michigan and became part of the International Breweries Company. This new mega-brewer seemed to be on the way to becoming a national superpower in the brewing industry, but as history tells, it did not. In 1971 the economic pressure of the other midwestern national mega-brewers proved too great, and they shut down for good.